The Puget Sound Koi Club made a return engagement to the Puyallup Spring Fair held at the Western Washington Fair Grounds in Puyallup, Washington from April 15 - 18, 2010. The club maintained its prime location in the main exhibition building near a main entrance and next to a local koi/pond vendor where we were visited by many of the nearly 127,000 attendees at this year’s fair. The booth was staffed for the entire run of the fair by eager club members. Special recognition goes to John and Cindy Hillstrom and Rick Beasley for staffing the booth when no one else was available. The club display included flyers, brochures, and other informational offerings for interested attendees. The handouts included information on the club’s upcoming koi show, bus tour and club membership, PNKCA membership, preparing koi for a show, pond and water maintenance, and manufacturer pamphlets for pond and koi related products. There was a lot of interest in the hobby of koi ownership. There were very few times when club members weren’t busy describing club activities, the best ways to set up or care for a pond, and koi health with interested fair goers. This Spring Fair was one of the best for our club. We made good contacts with other vendors and even added several new members just from the fair. The interest from the public is very high and encourages us to continue our efforts at future events. One of Inland Empire Water Garden & Koi Society's most important community activities has been to "adopt" the pond in the Nishinomiya Tsutakawa Memorial Garden (the Japanese garden in Manito Park, Spokane, WA). Starting in 2005 a major cleaning of the pond and koi health check was done. This was the first clean out of the pond since it was built in 1974. Our club members continue to volunteer their time by doing an annual health check of the Koi residing therein, as well as checking on the need of another major clean up of the pond itself. Sadly, a few of koi had died over the winter of 2007-2008. As the weather warmed up in the spring of 2008, more and more koi started dying. Koi health checks were done and finally testing for diseases was done. It was found that the koi had Koi Herpes Virus (KHV), a virus that is fatal to koi. Spokane lost all of the koi in the pond due to this disease. It is thought that KHV was introduced to the pond by someone "donating" goldfish or koi to the pond without permission. At our health check and clean out of the pond on May 30, 2009, it was discovered that we again had goldfish in the pond. This could mean the death of our koi so IEWG&KS helped the park department prepare a sign to place at the gates of the Japanese Gardens to alert the public of the health risks to the koi by donating any type of fish in the pond. 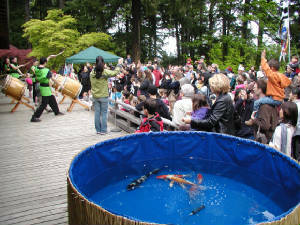 It was decided to focus on the education of the public on KHV during Japan Week (April 17 – 25, 2010, at the Japanese Garden Festival held on April 25, 2010. Signs were posted and members were available to answer any and all questions the public had regarding KHV and koi. We asked the public to please help spread the word to not place any fish in the pond! We told everyone that we could (visitors totaled over 2,000) that Goldfish can be carriers of KHV and if a koi survives KHV, it can be a carrier also. No koi or goldfish should ever be introduced to the pond by individuals! A quarantine process needs to be followed before any koi are introduced. This is what was done to the 30 koi that were donated by members of our club in the fall of 2009. The pond itself had to be disinfected and dried out before any koi could be placed back in the pond. The koi that were donated underwent a rigorous health check and quarantine procedure. Over the winter of 2009 through 2010 we lost 4 of our koi due to predator attacks (heron and raccoon). We found during our clean-up of June 5, 2010, that we had 26 healthy koi in the pond. The koi spawned and numerous baby koi were removed and replaced with larger koi that had a better chance of survival (those rotten heron and raccoons) for the summer. More koi were quarantined and we have approximately 50 koi in the pond at this time. It is our goal as a club to continue to educate the public so the citizens of Spokane, who own these koi, can all be part of educating others as to how to keep these koi healthy and keep the Japanese Gardens as a heritage for our children and their children. Once again, our club staffed a Washington Koi and Water Garden Society booth at the 2010 Bothell River Fest celebration on Sunday August 29th. Lots of people stopped by for the wonder of Koi and tell their stories about their encounters with raccoons, river otters and the bird! We had our show postcards advertising our Show in Sept. along with our registration forms to join our club. We had a display with pictures of varies ponds and Koi. We had handouts and a picture drawn of a Koi for the children to take home and color. We answered a lot of questions and informed them the benefits of being a member of our club. Karen Miller put together a book with the information and care of Koi for the children to take home and read. We kept Electra at home in her quarantine box! We didn’t want to stress her out because her owners were in Boise for the Idaho’s Living Gems convention that weekend. We bonded with many people who had the same passion as us about Koi. The River Fest organizers were glad to see us back! Every year, on the first Sunday in May, (this year it was May 2nd ) a couple of members of the club visit the Japanese Garden for an afternoon of fun and pure enjoyment with the children who come to celebrate Children’s Day. On the east deck of the garden’s pavilion, a show tank is set up to display several beautiful koi for the children to admire throughout the day. Club members talk to the children as they come to visit the koi and also answer the many interesting questions from these inquisitive little minds; “How old are they?”, “Do they bite?”, “Do they have names?”, “Do you eat them?” , “How big do they get?”, “How long do they live?”, “Can I pet them?”, the list goes on and on! This exciting day began with the children helping Dave Takahashi to raise the koi no bori (carp kites) on the flag standard and a koi kite parade through the garden. In the Japanese culture, carp are symbolic of courage and the custom is to fly one, in honor of each male child in the home, on Boy’s Day. This is to encourage the boys to overcome obstacles with fortitude, just like the carp swimming upstream. After the koi kite parade, The Taiko Drummers, from Portland Youth Taiko, did an explosive demonstration. If you have never had the opportunity to experience this very expressive, thunderous, and emotional music, you have missed a treat! The children played the drums with such enjoyment and pure love of the moment that everyone there was totally enchanted. As this beautiful, early spring afternoon progressed the children enjoyed many activities at the Garden. There were several hands-on activities for the children to do; coloring koi flags, folding Japanese hats, and collecting the stamps around the garden. 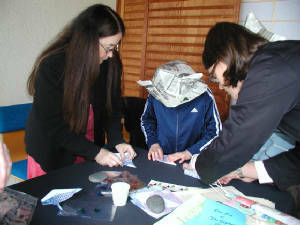 The club also provided koi origami for the children to fold, an educational (child’s level) brochure and koi stickers. Every parent and child took home lots of beautiful pieces of their own artistic creations, and many wonderful memories. Both the warmth of the children and the beautiful early spring afternoon combined to make this day a very rewarding and memorable one for the members of the Northwest Koi and Goldfish Club. It was a beautiful afternoon and Larry and I really enjoyed talking to the children and experiencing their excitement and fascination with our beautiful koi. We always treasure this fun afternoon with our future koi keepers and look forward to it every year! 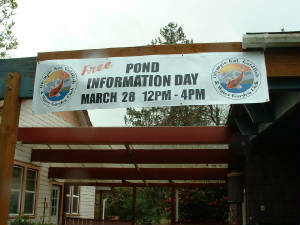 The Olympic Koi, Goldfish and Watergarden Club held it's annual Pond Information Day on the 28th of March. The event was well advertised and we had about 25 people who attended, besides the support of many of our club members. Our club is very lucky to have many extremely knowledgeable people who are welling to attend and teach seminars on various subjects each year. Classes that were taught included, Think before you dig, Electrical & Aeration, Pond construction, and Filtration types and benefits. Our club members had a barbecue, with our members bringing potluck dishes for after the club event. 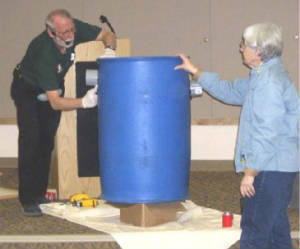 On March 27, 2010, at a local library in Kennewick, WA, Steve Joneli of High Desert Koi Ponds met MCKPC members and several members of the public for a seminar on how to build a sand filter. Steve showed the audience his version of a sand filter, one that he's perfected over several years. 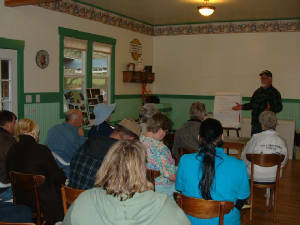 About 35 people attended the meeting, and Steve had their total attention. Many questions were asked and a lot of information was shared that day. The seminar began at 10 a.m., broke for a potluck lunch, and resumed at 1 p.m. and ended at 3 p.m. Pictured here, Steve had a member of the audience come up and help him with one part of the construction. At the end of the day, the filter was auctioned off and Steve generously split the proceeds with the club 50/50. It was an excellent day, everyone enjoyed the event. The club had at least three families renew their memberships that day and we got one new membership from the meeting. It was a great day!